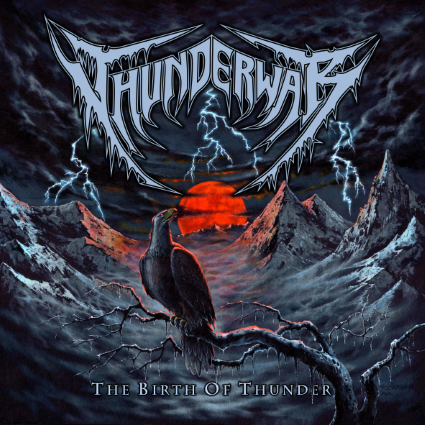 A breath of fetid fresh air, Thunderwar’s self-released The Birth of Thunder slaps you across your jaded metal head with death metal-by-way-of catchy, quasi-melodic thrash (without the shorts-wearing silliness). Taking cues mainly from Vader, Unleashed, and – what’s this? Yes, a little bit of Rust In Peace Megadeth – this Polish four pack bring van Drunen-barking atop femur-slicing, razor-sharp riffage that recalls speed metal with class, without coming across as retro or ironic, suffused as their music is with enough death metal blasting and hammering to leave the knobs pushed up to 11 for the whole twenty minutes or so it will take you to listen to this EP’s four songs. I hear Extreme Aggression-era energy amongst the riffmeister influences of their aforementioned influences, all combed-over with that clean American Thrash picking and soloing technique, all bloodlined with that Euro-Death moldy intensity. Even when things quiet down briefly during the acoustic title track, double-bass drumwork and eerie synths fill the eardrums with the unmistakable sound of unholy death. You haven’t lived until you’ve heard someone death-growl ‘Eagle of Glory!’ What vocalist/bassist Kamil “Madness” Mandes is talking about on this track and why said bird graces the cover I have no idea, but he’s full of piss and vinegar, and thus inspired, I would gladly pick up my metaphorical blade and join him on the field of thrash/death devastation. ~ by cliftonium on January 8, 2014. I’d say it’s like Amon Amarth, but with braver arrangements and not as poppy. Vocals are a bit too rhythmically regular, but overall, this sounds good. Is there anyplace I can get this without putting a lot of credit card info on a Polish website? thanks. I’m happy to pay for it, but just not excited to put credit card info blindly into an all polish website— so if they give me an email address that takes paypal, i’ll gladly support! This is pretty killer. I would pick up a copy to but like Zahler I am a little apprehensive about putting credit card info into an all polish website. I’d be interested if there was another way to pay or if there was a distro that carried it. I checedk out a couple of the other tracks from their ep on youtube and they sounded good too. Be curious to see how a full length from these guys would turn out. A band to watch for sure. great. put me down for one. and when you speak to them, advise them to link through paypal if they want to sell internationally from poland— i buy stuff from russia, japan, etc. with no problem because i’m not required to give all of my info to some dude in an arctic hut. Put me down for one too. Just let me know if and when you get some in and I will send my $$$. This entry was posted on January 8, 2014 at 8:26 pm and is filed under ALL REVIEWS, T-reviews.You can follow any responses to this entry through the RSS 2.0 feed.You can leave a response, or trackback from your own site.